When Luffy first started using Gear Second, it was claimed that this was shortening his lifespan as it requires his body to work more than it normally does. Is this not the case anymore? And if not, why? What changed? 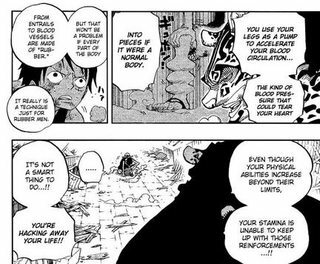 Luffy has been using Gear Second in many fights now and there does not seem to be that worry anymore. Or is this something that will be addressed later in the story? When Luffy first developed his 2nd Gear, he would pump blood through out the entirety of his body and increase the blood flow, doing so enabled his tissue and organs to access more oxygen and nutrients, hence making him match up with opponents who were stronger than him. The problem however occurred with prolonged use of the technique, due to the fast rate of metabolism from increased blood flow, luffy would burn up nutrients rapidly, and the less nutrients he had, the less energy he had to continue fighting, but since he's stubborn, he'd still continue using it, and at that point the technique hacks away at his life force because his body is being overworked with little nutrients. Moreover, during the 2 year time skip, luffy trained under Reilegh, and was able to fully master and perfect his 2nd gear, to the point where he only needed to pump blood increasingly through the parts he needed to use for fighting. Although this helped reduced the effects, I believe the 2nd gear becomes more dangerous when he uses it past its limits. So to finally answer your question, the second gear still negatively affects luffy and chips away at his lifespan, but when compared to the time he first developed the technique, the effects are not that great. The main technique that poses more of a threat to luffy is his fourth gear, which is a completely different case. Does the size of a person matter when Devil Fruit powers are involved? In the Dressrosa Arc, why doesn't Luffy use Gear Second to quickly reach Doflamingo?